The mainstream art world is a world that exists so detached from everyday reality it is sometimes beyond comprehension. It is a world of strange rules, extreme pretence and six-figure-sums; a world populated and dominated by a small clique of elites who socialize in members only clubs where even the cheapest bottle of wine costs more than the wage most people earn in a week. To peer behind the curtains of this mad world is to stare in the bare face of crude wealth and pure delusion, as the debates surrounding an alleged Andy Warhol ‘fake’ earlier this week have once again illustrated. 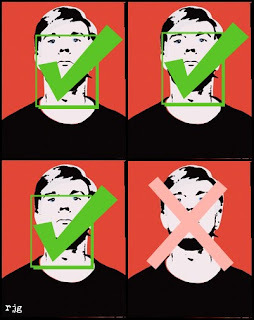 The likeness of the silk-screened Warhol self-portrait at the centre of the present controversy is not in dispute -- the argument is rather whether Warhol himself ‘approved’ the print or not. Many of his prints were mass produced, sometimes by people and sometimes by machines; Warhol’s job was simply to ‘approve’ their quality and with a swift signature, just like magic, the price would rocket. And rocket they would. The self-portrait in question, if judged to be genuine would be worth $2 million dollars – fake it is worth next to nothing. Art, when treated in such a way, is reduced to nothing other than branding; becoming less about aesthetic value or any emotive worth than about the signature that appears in the corner. A genuine Warhol is thus the Jimmy Choo shoe of the Art world, only unlike the Primark version of the designer shoe, there is actually zero difference between the fake and the genuine Warhol print – both were mass produced with only the profit motive in mind. Certainly, in the midst of economic crisis, and when the average wage remains £24,000, it is baffling to enter into the realms of the art world – a world where we can witness the crazed behaviour of individuals who will pay £7.8 million for a painting of a cow’s carcass, and who will furiously debate whether or not a Warhol print is mass produced and real ($2m) or mass produced and fake ($0) as if it actually matters. There’s no doubt about it: it would be better if the curtains stayed closed.